Other Products: White Cardstock; 5mm foam buds from Icraft; Glue Gloss Distress Ink in Victorian Velvet; Spellbinders Tiara Rondelle die. Instructions: For Card Base: Card base is 5.5 x 7.5 inches on white cardstock. Cut a pink paper from collection measuring 5.25 x 7.25 inches. Cut a white mat 5x7 inches and attach on top of base. Cut a pattern 4.75 x 6.75 inches for top panel of card. Attach to card base. Using the Tiara Rondelle from Spellbinders, cut out on white cardstock and attach a pink circle you will cut out using the Eyelet Circle Set. Stamp out 1 sets of the large peony using Coffee Archival ink on white cardstock. Stamp and cut out 2 sets of the small peony (the largest flower in this set) using Coffee Archival ink on white cardstock. Color centers of the flowers with Sunflower archival ink and outer edges with Victorian Velvet Distress Ink. Pierce in center with paper piercer to make room for stamen and foam buds. Stamp and cut one set of the smallest peony using Plum Archival ink on white cardstock, we will be using these as fillers. Color with Plum ink and pierce center to make room for the stamen. Stamp and cut 3 medium peony leaves using Coffee Archival ink on white cardstock. Stamp and cut out two of the Classic Rose Vines using Archival ink on white cardstock. Color both with Fern Green and Leaf Green Archival ink. To mold the flowers, I have cut an older molding mat in half and hot glued it together to form a double layer molding mat. Insert the foam bud in the center of the second largest peony placing glue in center, attach another layer of flower then add a layer of the largest peony. 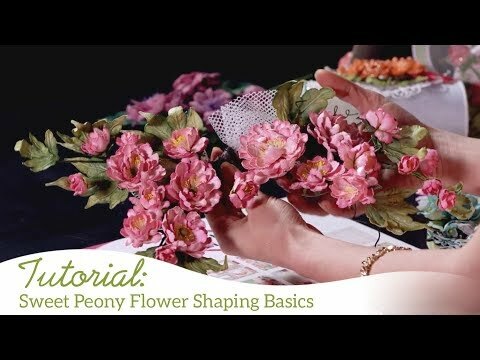 Create 1 large flower and one medium using the largest flower of the small peony set for the medium flower. Create four small flowers using the smallest peony with Plum ink and use these as fillers. Insert Pearl Stamen into centers. Do not throw away the cut off wire stems. Take the stylus tool and wrap the cut off wire around the stylus to form a curly wire piece, insert these throughout the flower clusters to add some detail. Detail all the flowers and leaves with Crystal Clear. Complete card as I have shown in my sample.